We were inspired by the early mission of Linkedin—keeping track of business connections is an incredibly important task, but we don't believe that they've properly adapted to the modern use cases. 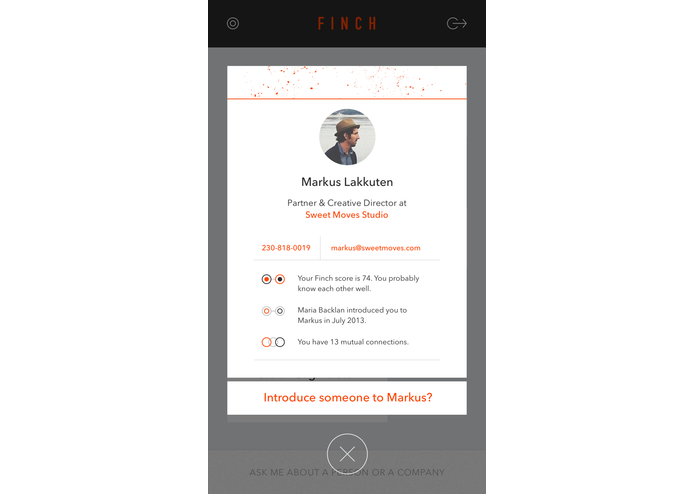 We live in an era where "knowing" someone and connecting with them on Linkedin does not carry as much weight, so we built Finch as an attempt remedy that. 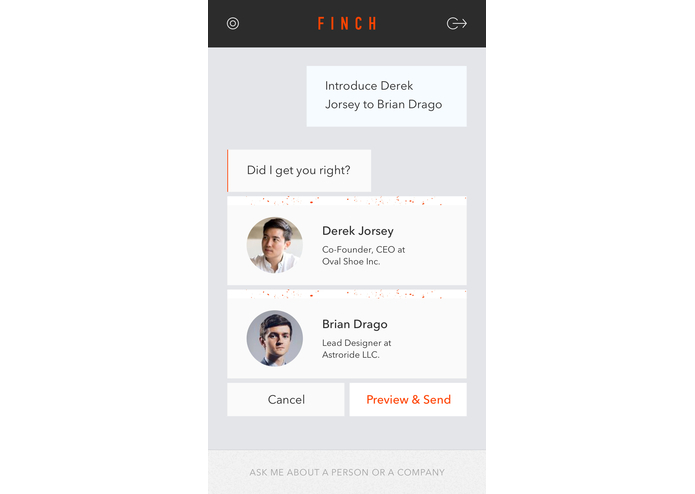 Finch is the best way to stay on top of your network. By connecting your email, Facebook, and soon many other services, we’ll be able to infer how close you actually are to those in your network. Our conversational interface makes querying work history, physical location, and sending introductions a breeze. We built out the backend using Node.js, Wit.ai to help train our own internal natural language platform, and Objective-C to build the iPhone app. One of the hardest problems that we ran into was accurately determining how close a user is to someone in their contacts or email history. 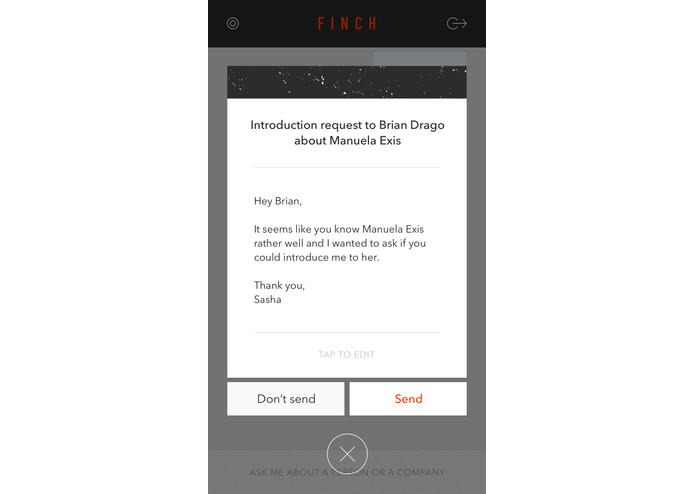 Context made this problem much easier to solve by allowing Finch to easily read email headers and gauge closeness through back and forth emails. In a little under a month, we built an app capable of understanding natural language, analyzing your network to respond to the query, and then sending off an introduction. For this first version, we have a fairly limited set of queries available. This has made it relatively easy to plot out all available conversation routes and answers, but is certainly not sustainable long-term. We’re building out the intro functionality as a premium feature, which will support read receipts, double opt-in support, and customizable templates. 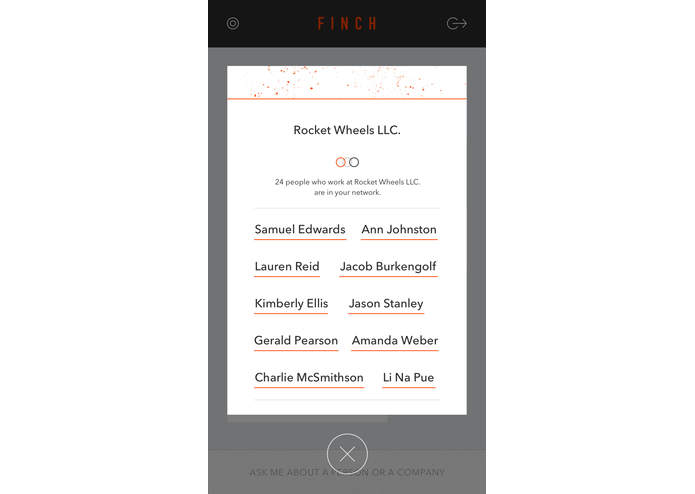 Another big update we’re working on contains the ability to form a “Company” in Finch, and connect multiple email addresses with the same domain. This will allow us to pool analysis across teams, enabling users to determine who they work with is the best sales lead or is friends with a potential hire. Branding, UX, design, motion graphics.